A new "Flow View" option for selecting the games has been added to the Select a Game dialog box. In the "Flow View" mode, the layouts are displayed in an horizontal gallery of thumbnails and can be scrolled by using the scroll bar at the bottom. The list in the left area will allow you to filter the games by various criteria, such as MahJong only, Matching only, Favorites, Not yet Played, Customized, etc. The new "Flow View" mode can be used by clicking the "Flow View" button in the top right of the Select a Game dialog box. Play traditional MahJong-type games with classical MahJong tile sets and millions of possible combinations! Play matching-type games with funny tile sets. Buy MahJong Suite and you'll get MahJong Suite Graphics Pack for free! 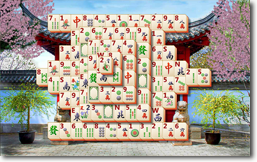 MahJong Suite Graphics Pack contains a collection of very beautiful Tile Sets and backgrounds to use with MahJong Suite. A theme is a set of graphic elements consisting in a background and a tile set. 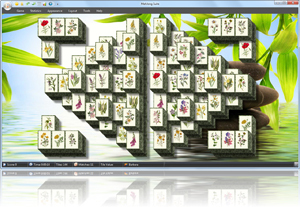 Several beautiful themes are included in MahJong Suite. Enter Hi-Scores and manage your Statistics. Play to reach the Hi-Score for every layout and manage games won, with 3D Graphics. Create an unlimited number of Players so that you can challenge your friends to beat one another's Hi-Scores, Games won, Score Statistics. 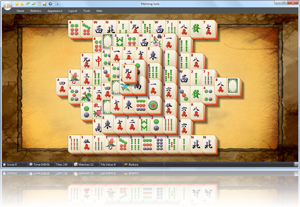 MahJong Suite features a lot of options such as: "Show a legal move" command; Complete Statistics with 3D Graphics; Layout Manager; Customize Tile Sets and Backgrounds; unlimited levels of the undo/redo; ability to save, load and restart games; high-quality on-line help; select a game number; select your favorite games; associate sound effects and much more!